For The Big Lunch as well as the Brioche Crown I’m doing my AWARD WINNING fig rolls. 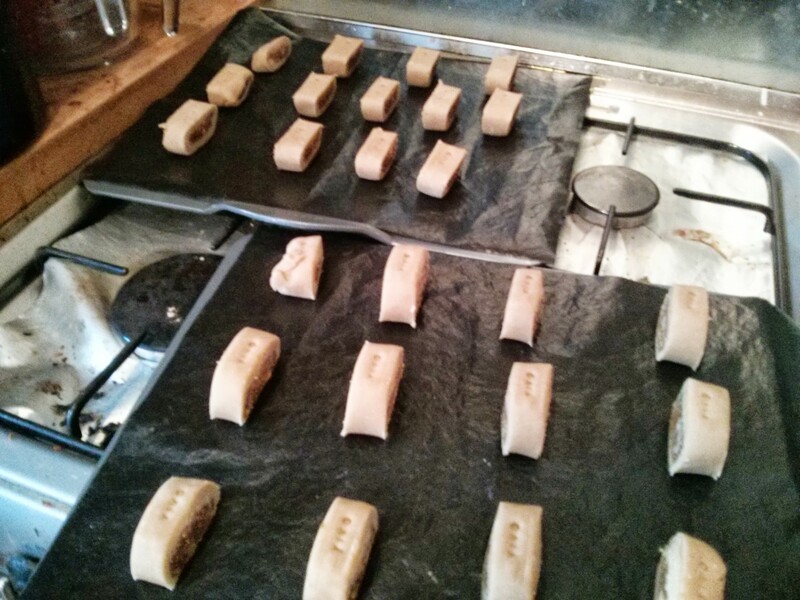 As I’ve not done the step-by-step pictures for fig rolls, I thought I’d do that now. A couple of changes from the previous fig rolls. 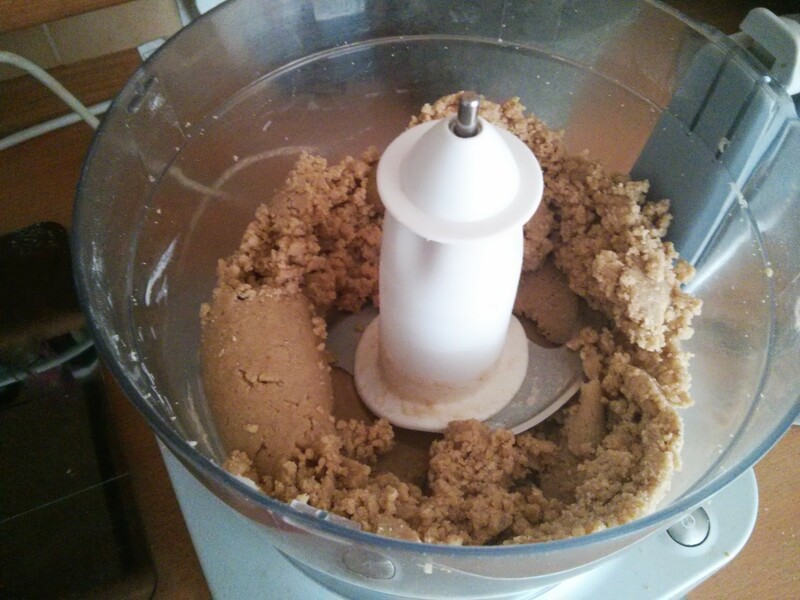 Firstly I added a teaspoon of cinnamon to the fig mix, which worked well so I’ve updated my master recipe. 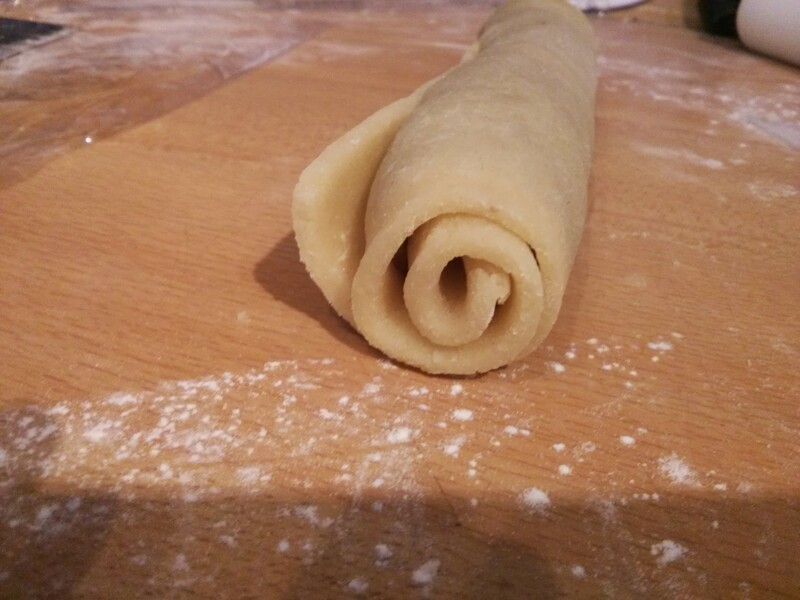 Secondly on half the rolls I constructed them differently: instead of fig paste rolled in marzipan rolled in pastry, I rolled up the marzipan and fig paste, to get a spiral effect, before wrapping in pastry. The idea was to make rolling up easier, and to hold together better… I’m not sure it helped in either way, but they do look pretty! 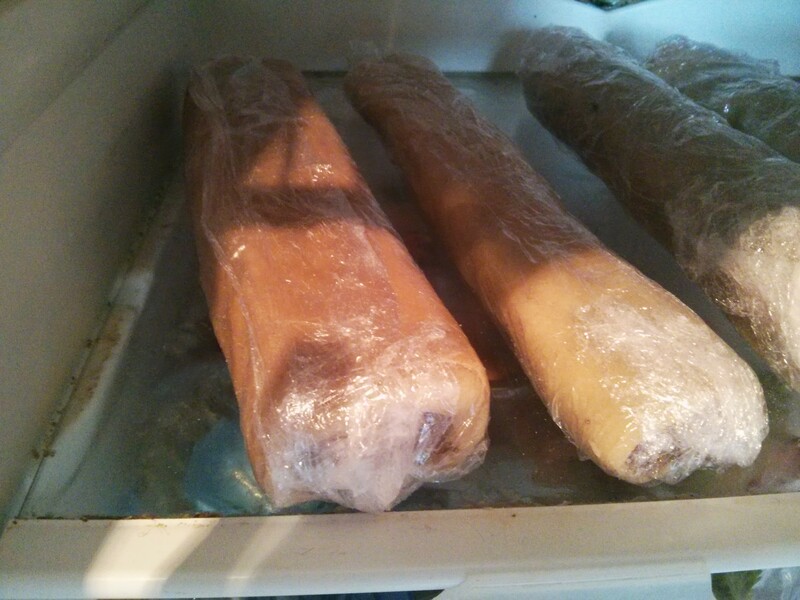 I start with the marzipan, which is just an almond sugar paste. 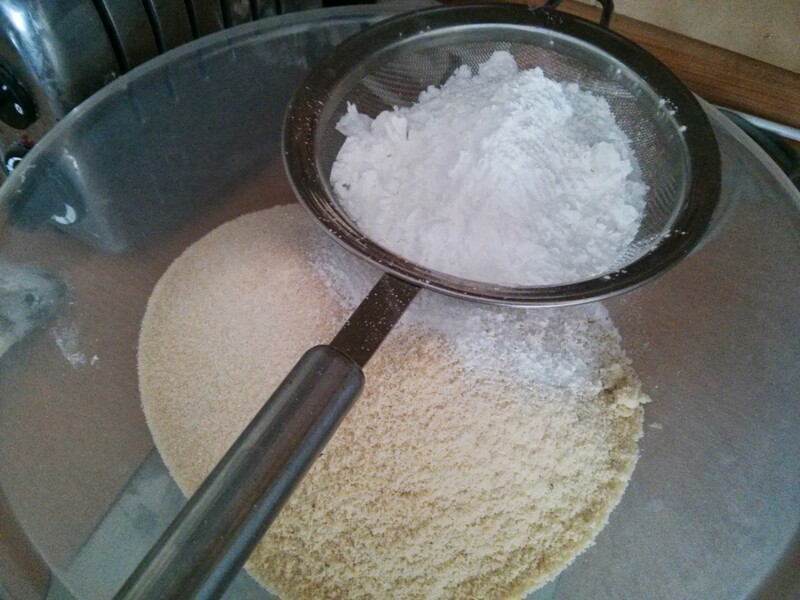 Start with 375g of ground almonds, 200f of golden caster sugar, and 200g of icing sugar (remember to sieve it!). Which these together so the ingredients are evenly spread. Then whisk together a large egg, the juice of one lemon, and 1 tsp of almond extract, then add to the dry ingredients. 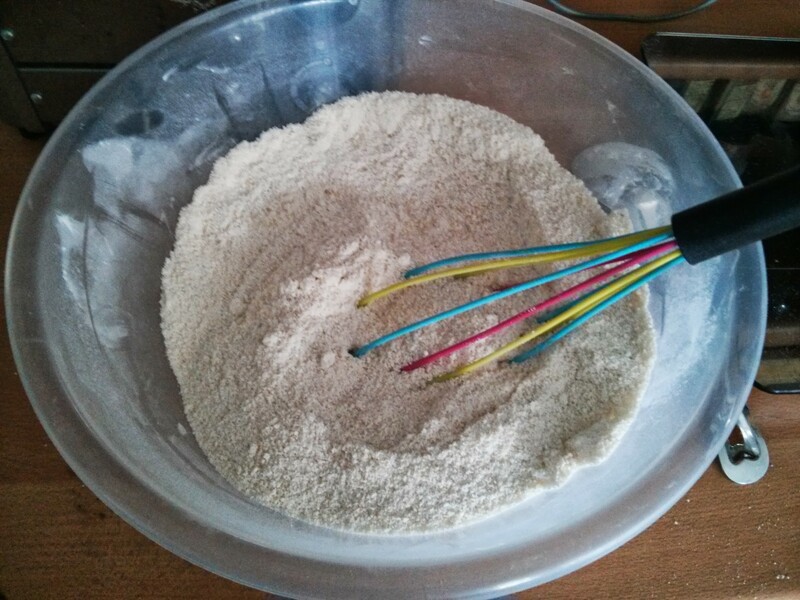 Then mix together with a fork. 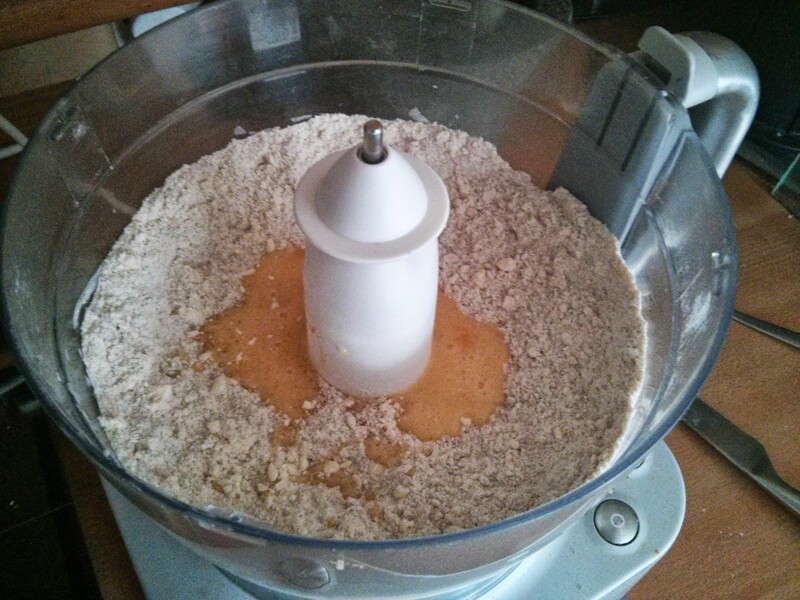 It’s pretty easy, so no need to create more washing up with the mixer or food processor. 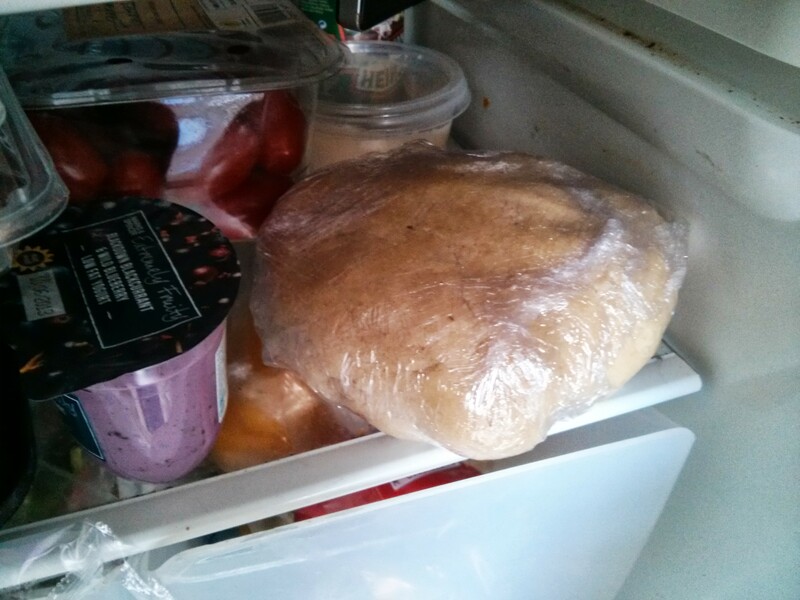 Once it starts to clump together form into a single lump of dough, cover in cling film and chill in the fridge until you need it. Then it’s pastry time. This is a nice simple pâte sucrée. Because I’m using marzipan I’ve already got an almond flavour, so I don’t need to add ground almonds to the pastry, which makes it much easier to work with (much less sticky when rolling out). 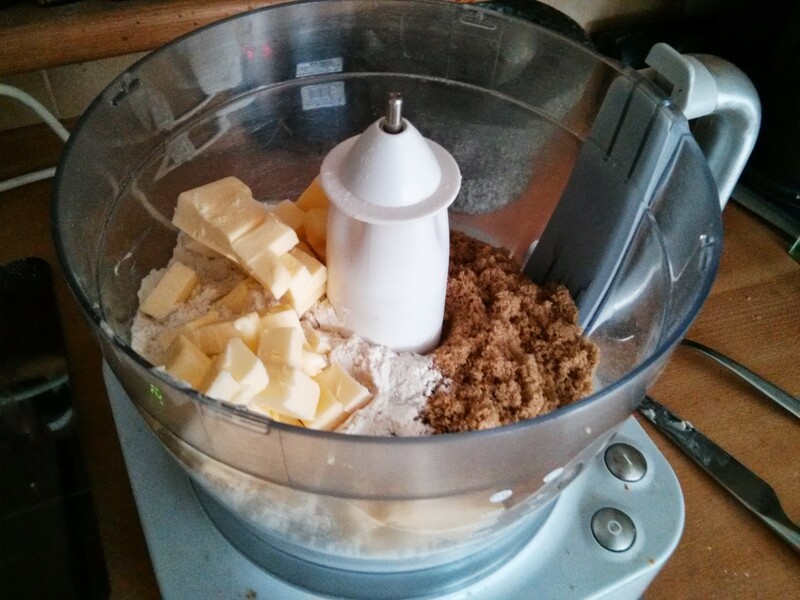 So… 250g plain flour, 3/4 tsp baking powder, 100g soft light brown sugar and 125g unsalted butter (form the fridge) all into the food processor and pulse until it looks like breadcrumbs. Whisk a medium egg, and add that to the mix. 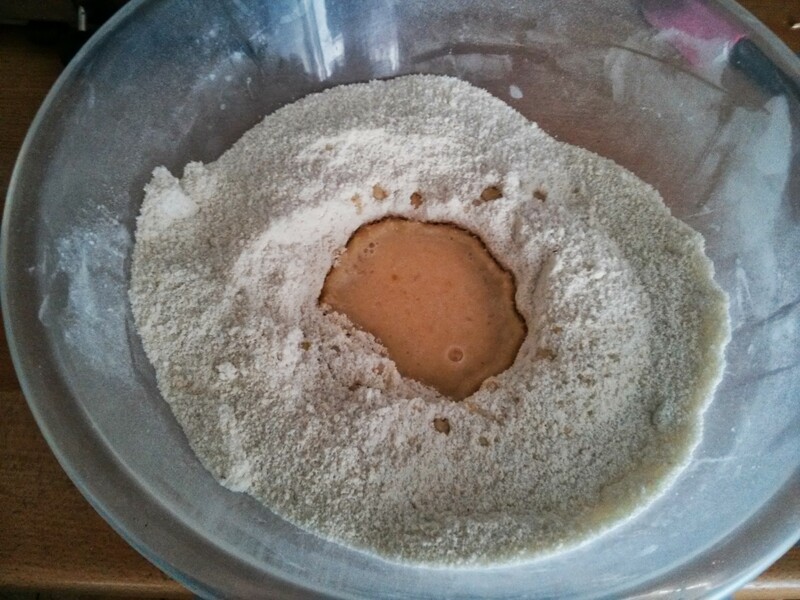 Then whiz until it starts to form a dough. 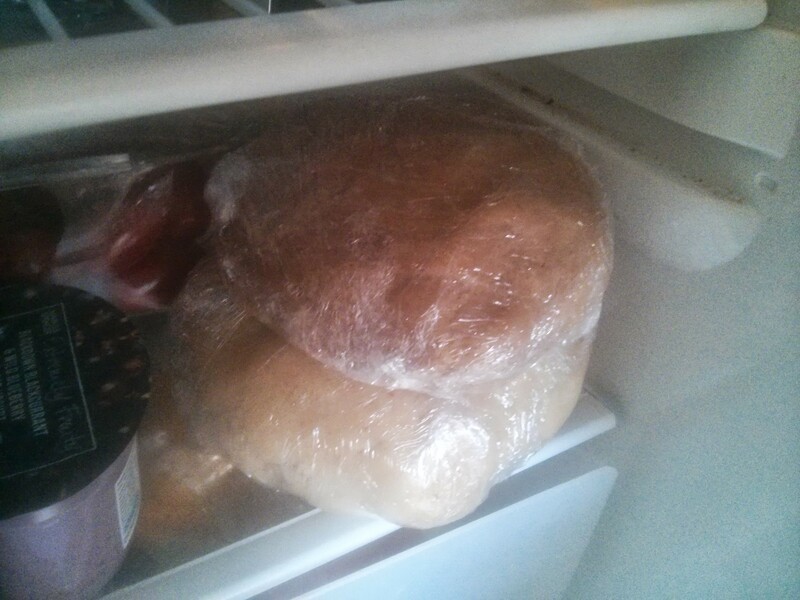 Then tip it out and form into a ball, cover in cling film, and into the fridge until needed. The final part to prep is the fig filling. 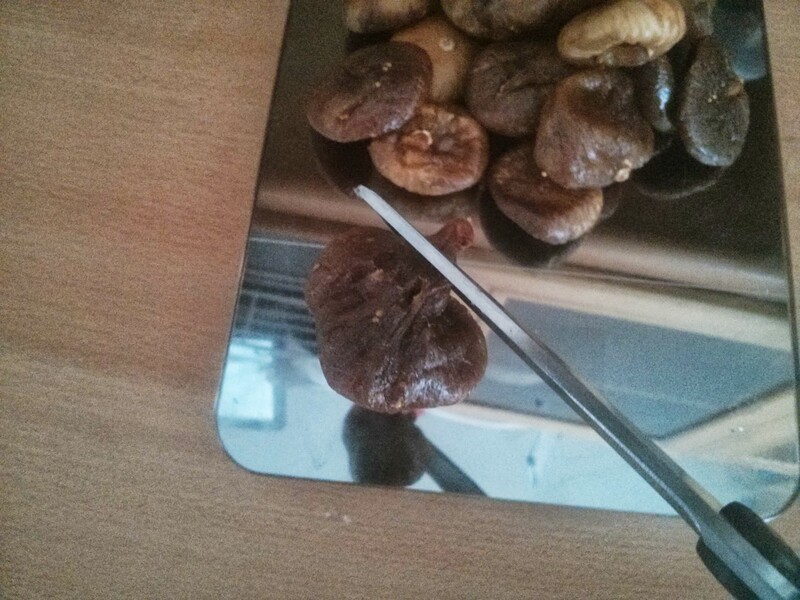 Start with 400g ready-to-eat dried figs. You’ll want to snip off the hard stalk part. 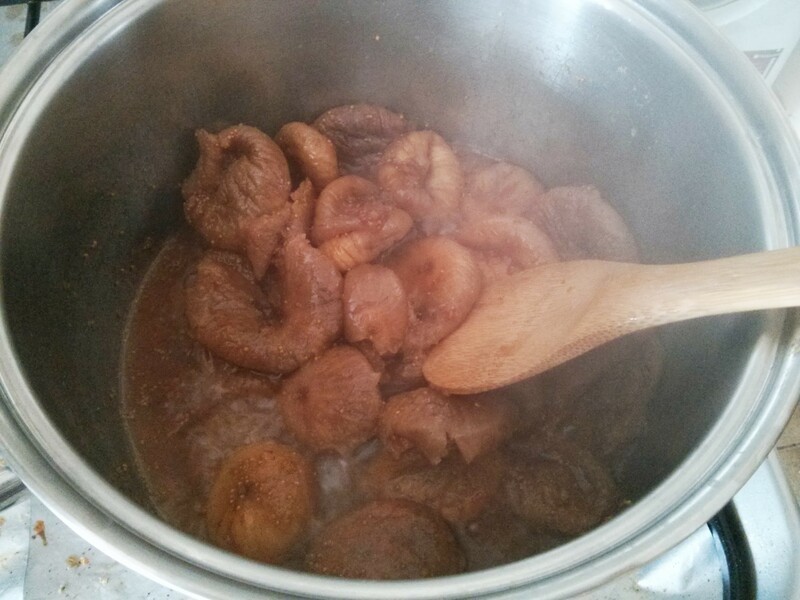 Then add them whole with 300ml of water to a large pan and simmer to ten minutes so they start to soften and break up. 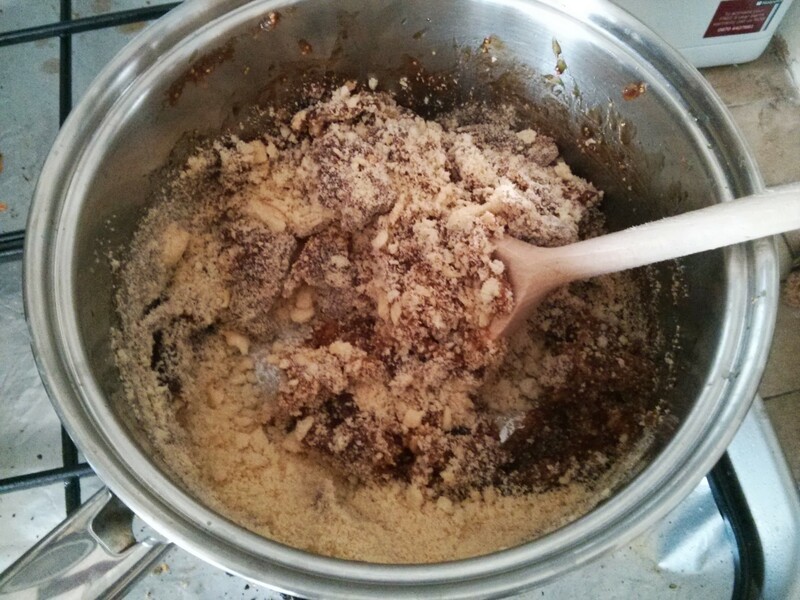 Then add 100g soft dark brown sugar, 2 tbsp honey, 1 tsp cinnamon to the mix, and keep simmering until the liquid is all thick and sticky. Then it comes off the heat, and it gets blended using a hand blender. Warning: cleaning the blender after this is a nightmare! Then if you’re worried that these biscuits are looking a bit healthy… it’s time to add cake! 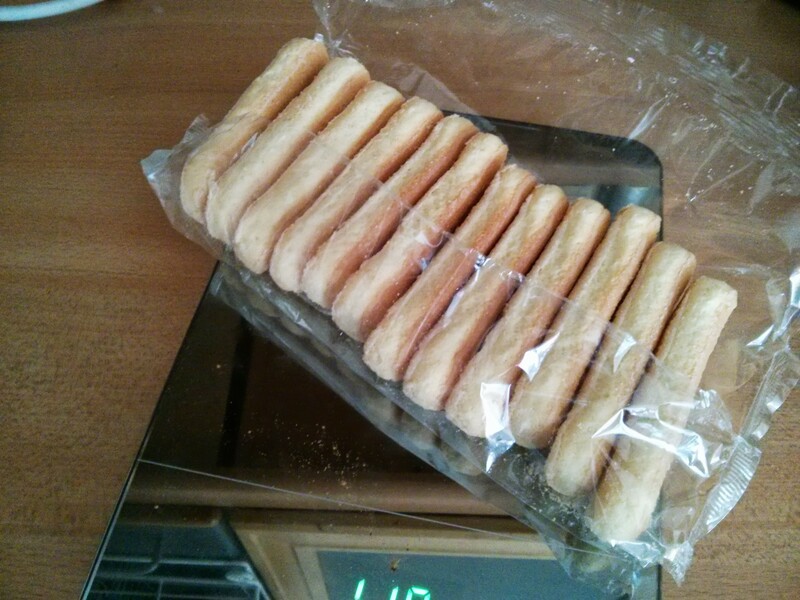 100g of lady’s fingers / trifle biscuits. 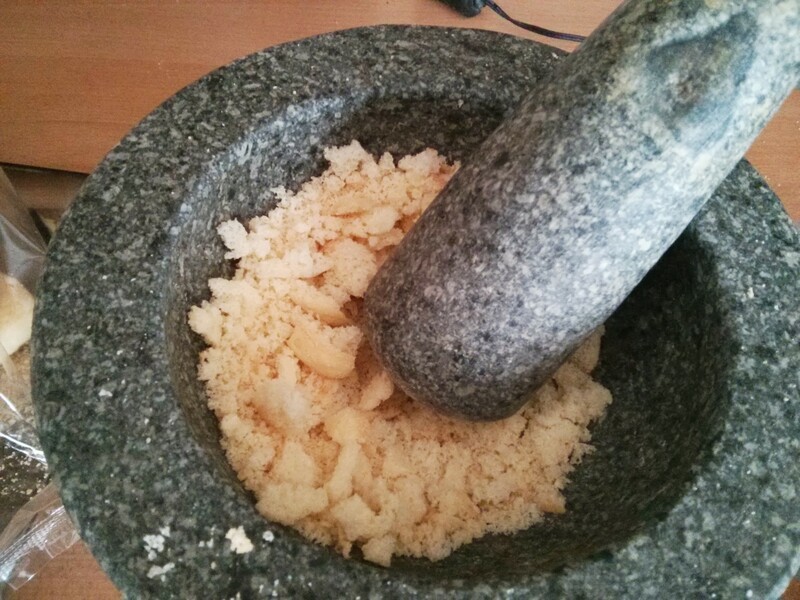 These need crushing up, and I use the pestle & mortar. These then get mixed into the figs. This then gets left on the hob to cool (covering the pan to avoid any kitteh-related incidents!). Finally we’re ready to construct the biscuits! Yeah… these are not quick spur-of-the-moment bakes! 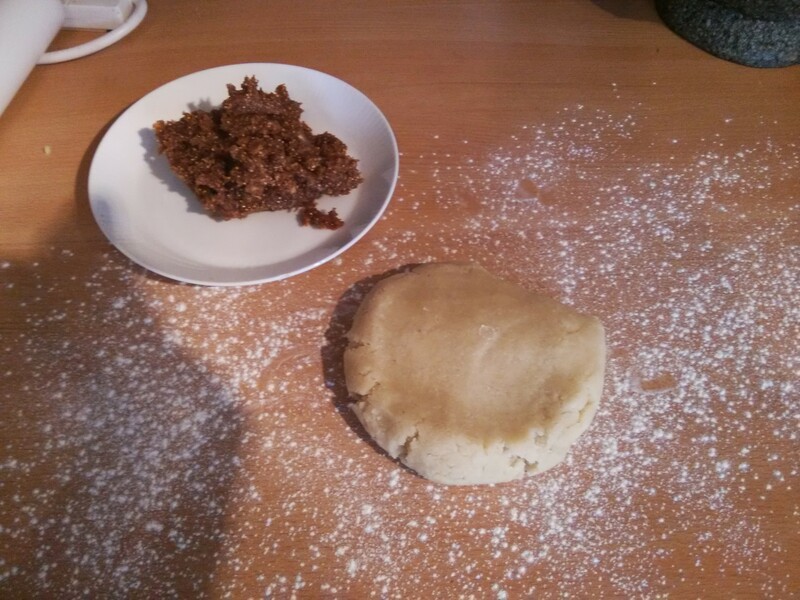 Split your fig paste into four equal parts (I weight mine to be safe) and get about 1/3 of the marzipan out of the fridge onto a floured surface. 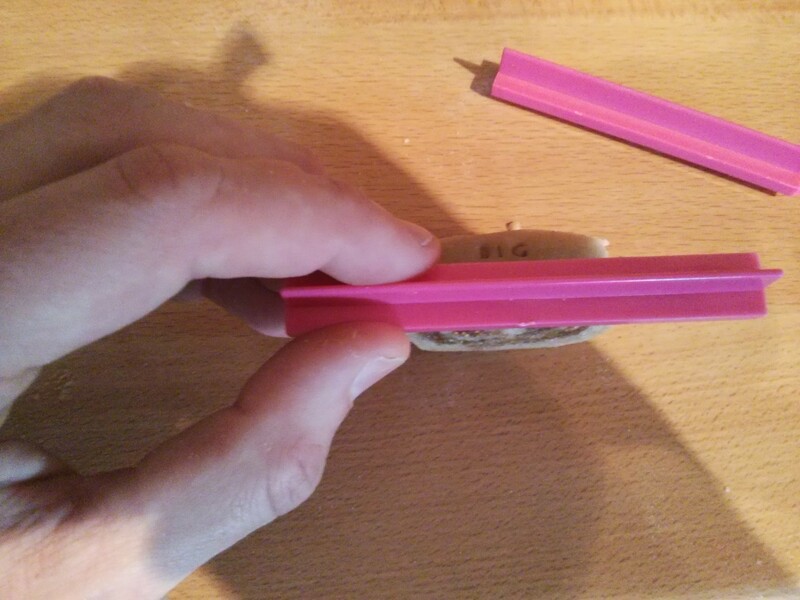 Roll out the marzipan to about 5mm thick, and you’ll want to be able to get about a 17cm square out of it. Yes… I use a ruler! 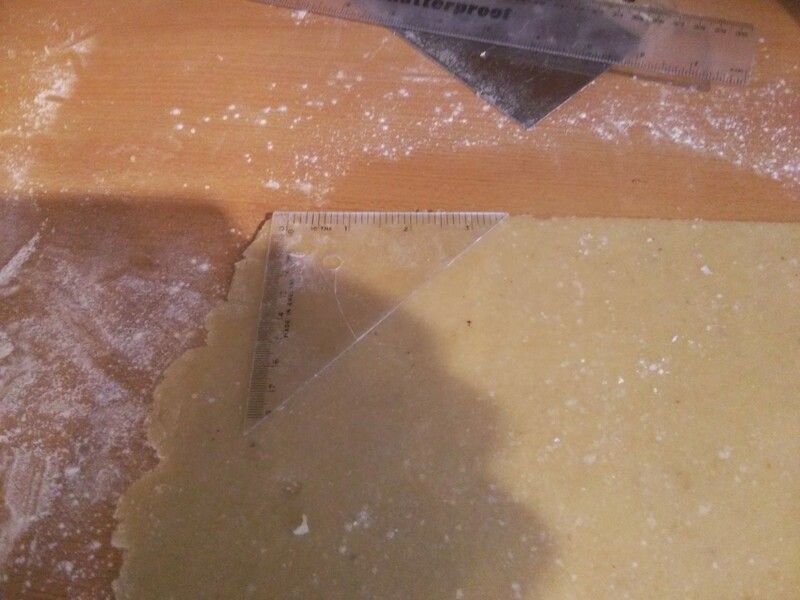 And using a set square (obviously…) I cut into a square. 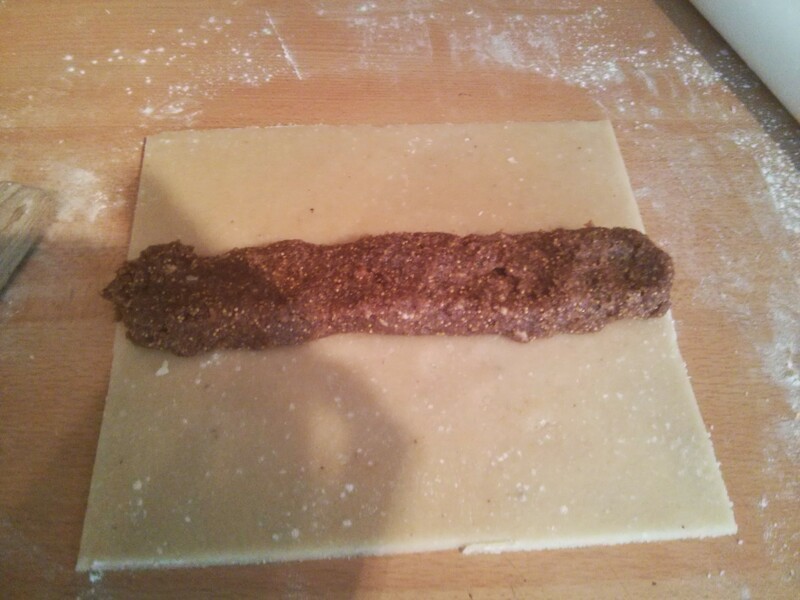 For the ‘traditional’ construction, make a sausage of the fig paste and put in the middle of the marzipan. 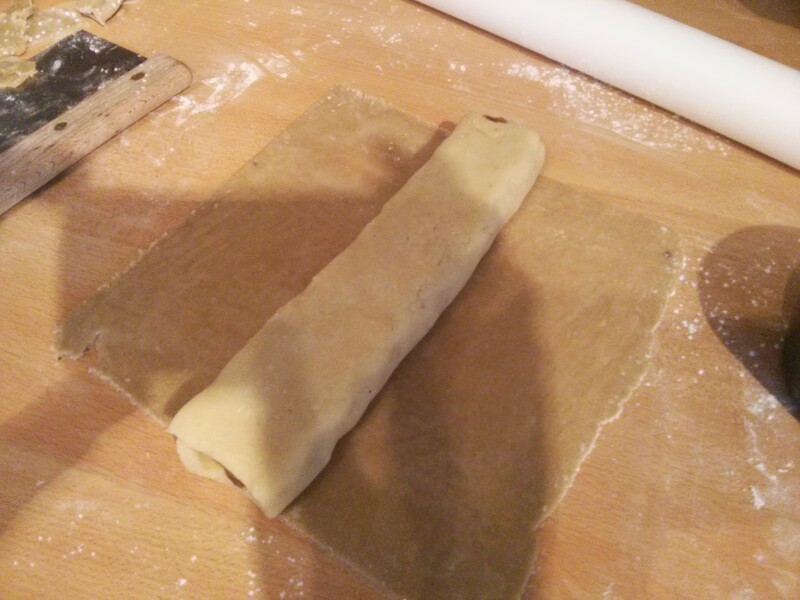 Then roll up the marzipan. 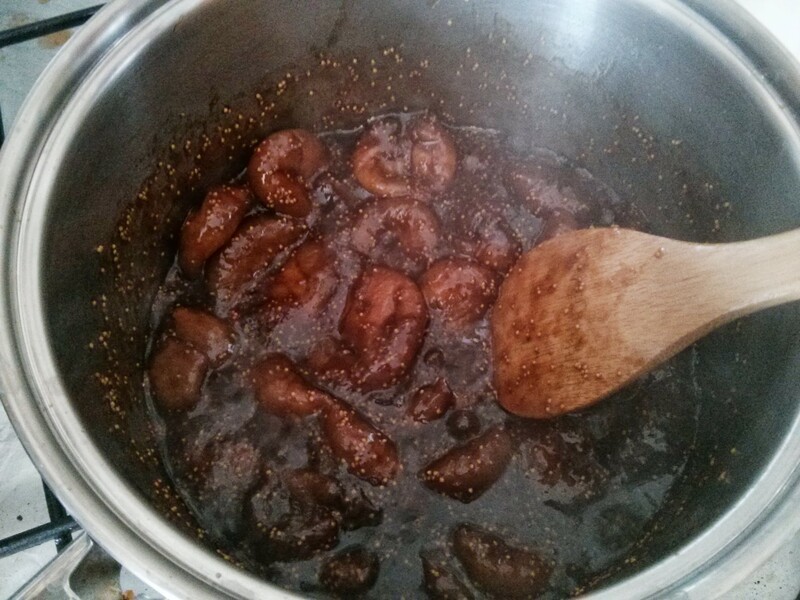 The fig paste is sticky enough so you don’t need anything to help it. Trim down the marzipan so it doesn’t overlap. 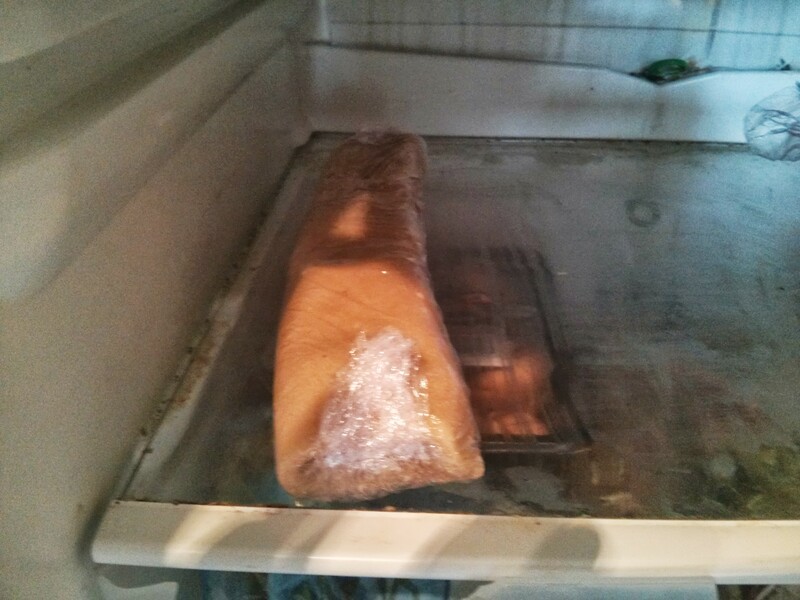 Then it’s into the fridge to chill. 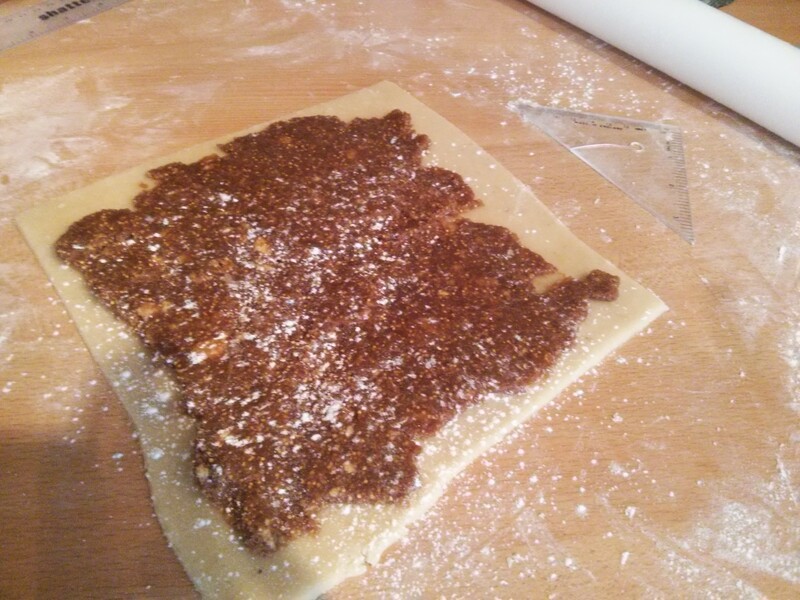 For the spiral construction, make a square of marzipan, then spread the fig paste over it. This was pretty difficult as I’d let the fig paste go fully cold. 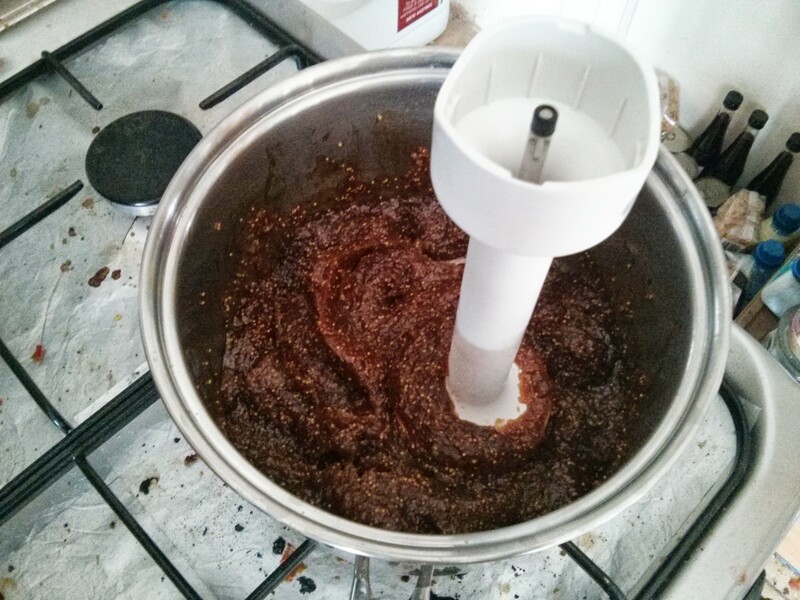 I think in future I’d use this method is the fig paste was hot, the traditional method if it’s cold. This then gets rolled up. 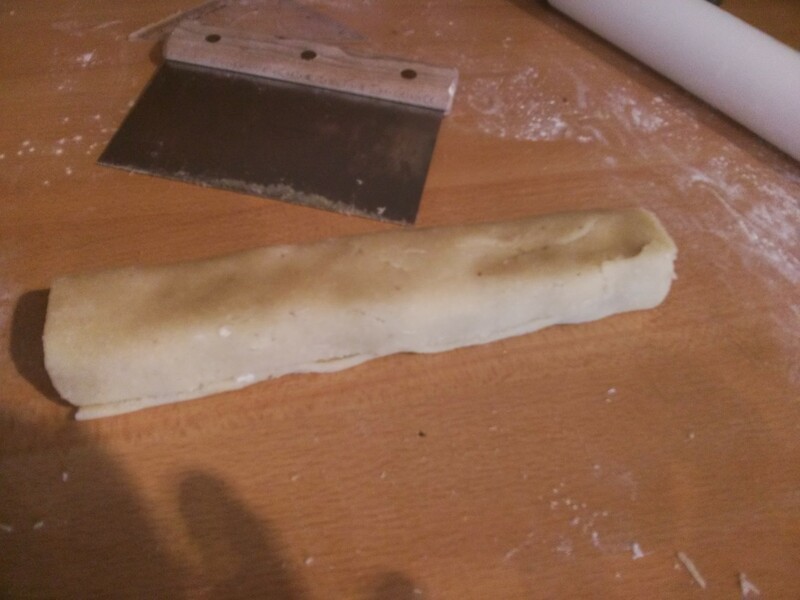 Once all the marzipan rolls are done, it’s time for the pastry. 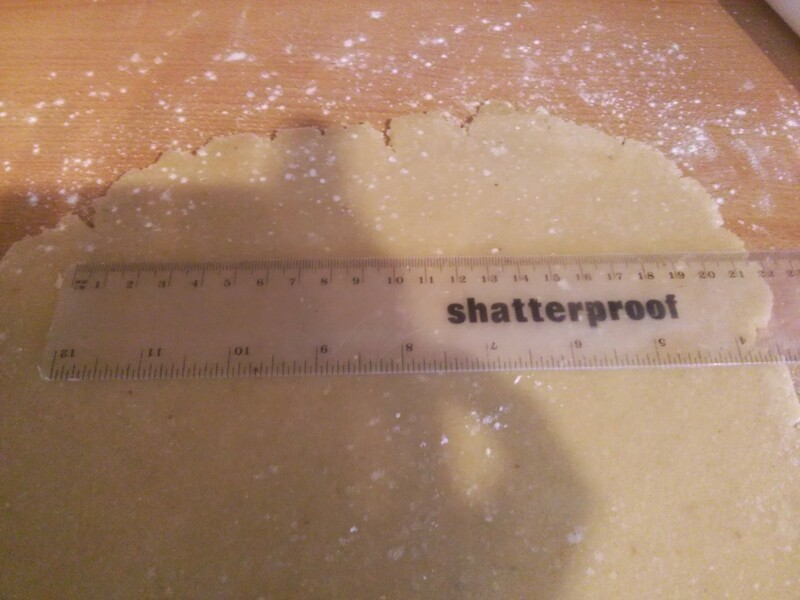 Roll these out (using rules, set squares, etc) into squares that match the size of each marzipan roll, given them an egg wash to help stick, and put the marzipan sausage on them. Then roll up, and into the fridge again. For baking, it’s oven to 160c fan. Cut each sausage into about 12 biscuits, and place on a lined baking tray. I bake in two batches, two trays per batch. Then bake for 25 mins. I normally do 15 mins, then swap the trays over, then a further 10 mins. However… this time they came out a bit dark: I wonder whether now I use the vern thermometer I should do 10 mins, swap, 10 mins then check. 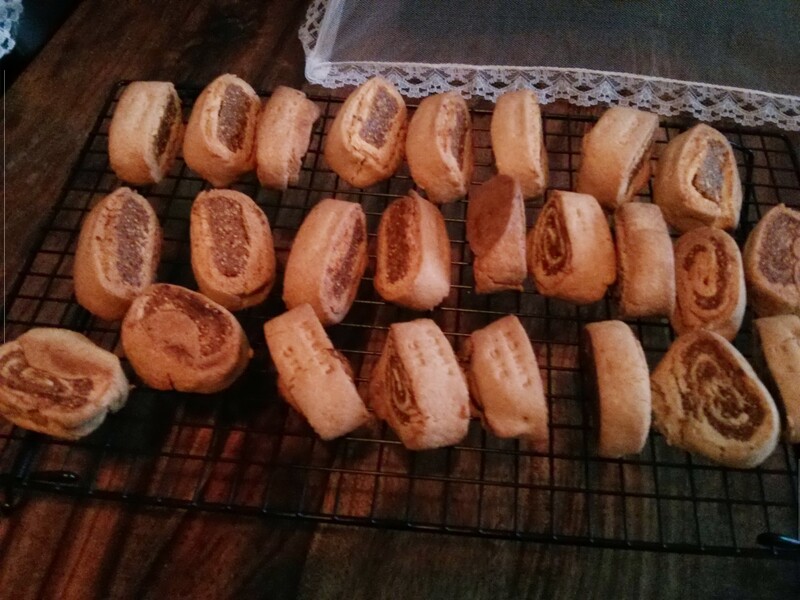 As you can see, some of them fell over during cooking… hard to avoid if you make them thin like I did here. Cutting into 8 per log would help avoid this. I have tasted an earlier version – absolutely delicious. I highly recommend them.